Finished snap should look like this from wrong side of fabric. Install snap as directed on packaging. Directions may vary slightly between products. Layer and pin flap interior fabric and cotton duck flap lining, wrong sides together. Mark snap center 1 3/4" from the bottom raw edge of fabrics and centered between sides. 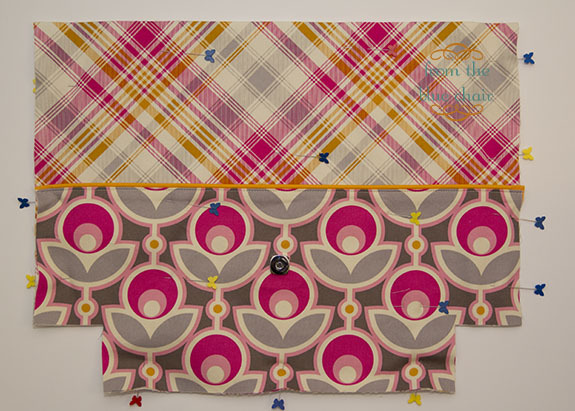 Center Peltex scrap or other interfacing and fuse to cotton duck fabric. 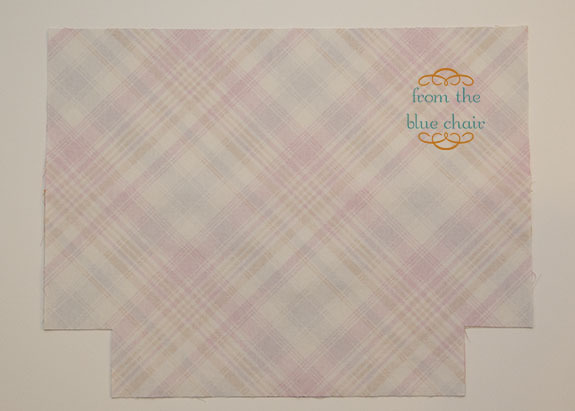 Add additional layer of cotton duck on top of interfacing if not using Peltex scrap. Make slit marks as directed on flap interior fabric. Very carefully cut through all layers with point of seam ripper. Test fit with snap prongs. 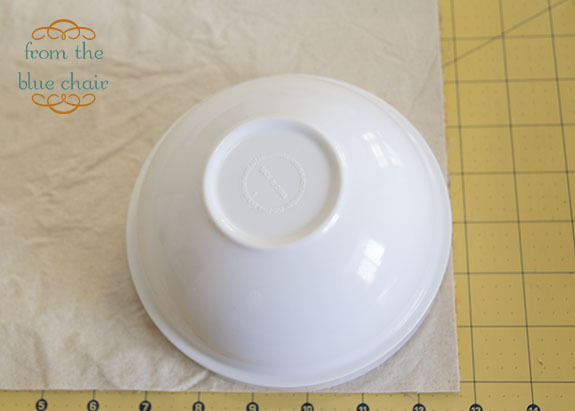 Apply small amount of fray check or super glue to fabric where snap will slid through. Work very quickly if using super glue. 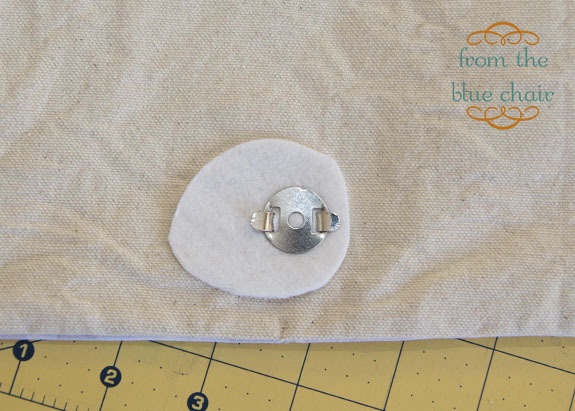 Slide snap prongs through right side of flap fabric to the interfacing and finally through metal disk. Fold prongs flat. Mark snap center 2 1/2" from top of finished pocket panel and centered between sides. 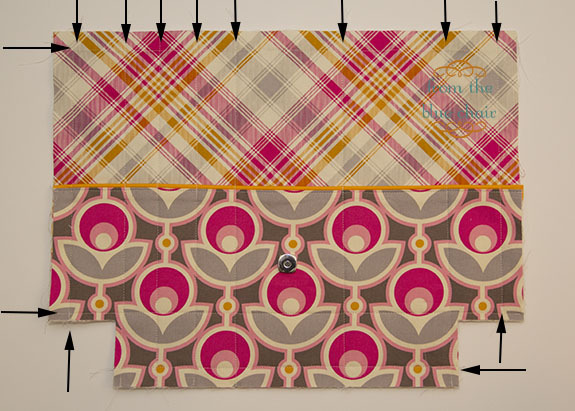 Attach Peltex or other interfacing to the wrong side of panel fabric. Install the snap base only in the pocket panel fabric, not the pocket panel lining. Pocket lining will cover snap back. Follow remaining steps as directed above. Finished snap should look like this from the wrong side of fabric. 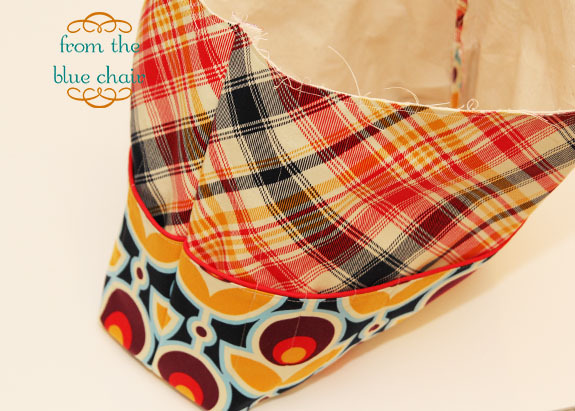 Mark rounded corners using a medium sized bowl on the wrong side of fabric. This line will act as the edge of fabric, but do not trim yet. I find it easier to stitched the curves first and then trim excess. 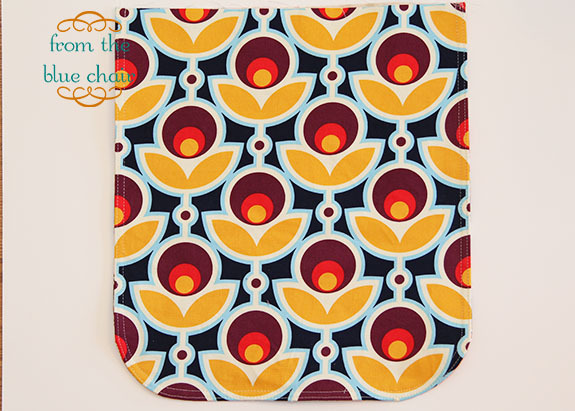 Sandwich together and pin flap interior (with snap installed and cotton duck attached) right sides together with flap exterior fabric. Stitch 1/4" seam around sides and base of flap. Leave top open. Trim excess from rounded corners. Notch curves, careful not to clip stitches. Flip right sides out. Press flat. Top stitch 1/8" from edge. Add additional row of stitching at 1/4" if desired. Flap interior with snap installed. 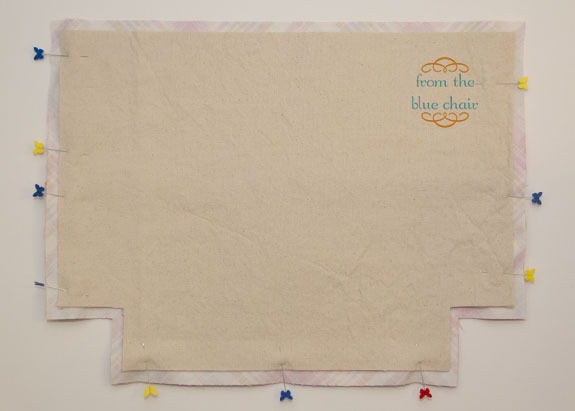 Supplies needed for this step: (2) Prepared exterior pocket panels, (2) bag body (13.75" x 18"), (2) cotton duck interlining (12.75" x 17"), Hera marker or other removable marking pen, denim needle, walking foot. 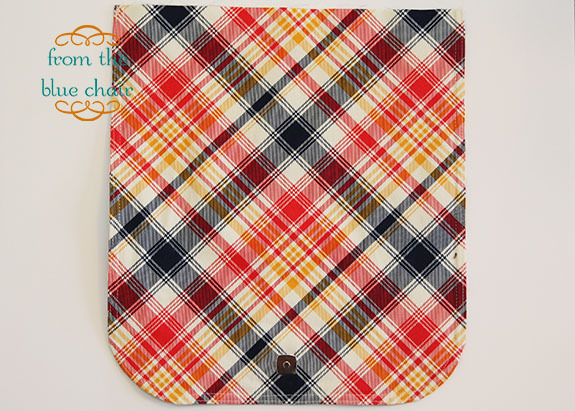 Prepare sections by cutting 2 1/2" squares from the bottom corners of the pocket panels, bag body pieces, and cotton duck pieces. Place pocket panel face down. Layer bag body piece on top of pocket panel lining up bottom and side raw edges. 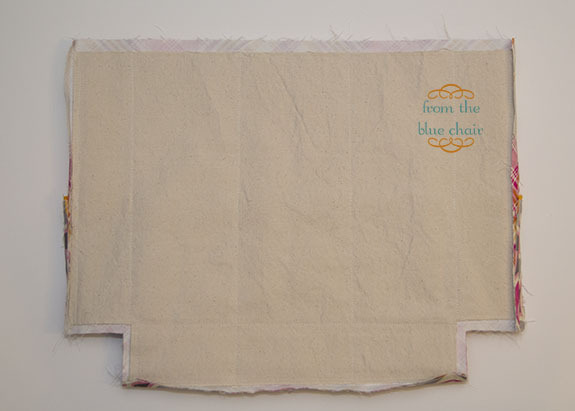 Place cotton duck fabric on top of bag body, centering as shown. Pin well. 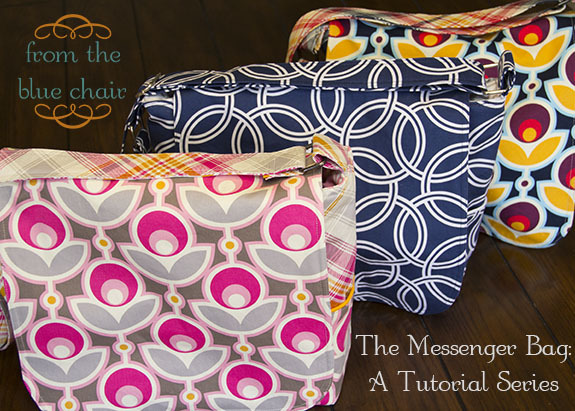 Flip over and make sure all fabrics are laying flat. 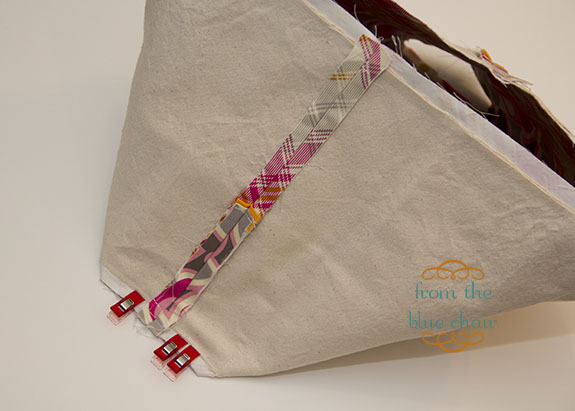 Add a few additional pins in center of bag to keep all layers together. Match completed bag front and back, right sides together. Stitch bottom seam first using 1/2" seam allowance. Press seam open. Stitch side seams with 1/2" seam allowance. Press seams open. Flatten corners and match seams to make boxed bottom. Pin or clip together. 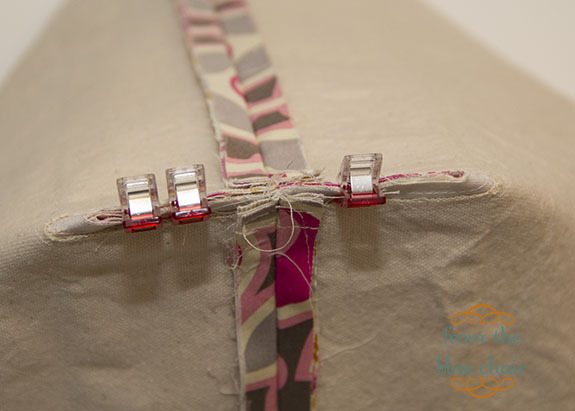 Sew each bottom corner seam with a 1/4" seam allowance. 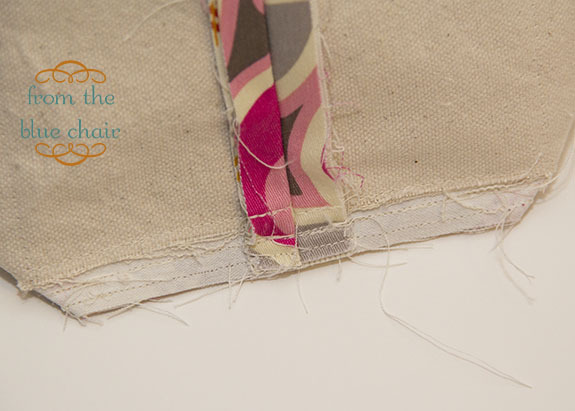 If desired reinforce seam with additional stitching at 1/8". Stitch slowly, especially over seam. This is bulky and can be difficult for a machine. Thank you for this tutorial and your very clear instructions. 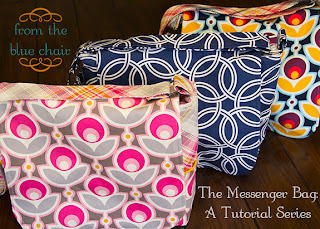 I've been following along and hope to make this bag soon-it's exactly what I need! You are so generous to put this on your blog-thanks. This is fantastic - thank you!! I have made a few messenger bags, but have not yet put in a snap. I'd been putting it off, but am now confident that with your tutorial I won't mess it up! Hi , My name is Lorma. I just found your tutorial. I am planning to us this for 8 bags for Christian ladies in our church to take on a trip. Just wanted to share.